Faith United Methodist Church located at 128 East Market St.
St. James Lutheran Church located at 180 W. Market St.
Trinity United Church of Christ located at 200 East Market St.
Valley View Alliance Church located just outside the Borough at 200 Alliance Ave. There are two (2) pavilions that are available for rent, the Oak Pavilion (lower parking level) and the Maple Pavilion (upper parking level). To check availability, see our calender on the home page first as a preliminary check, then please contact the Borough office during regular business hours to verify availability if you would like to rent either pavilion. You may click on this link to download a contract. Please note you do not have a valid reservation until confirmed by the staff. You may view or download park regulations here. 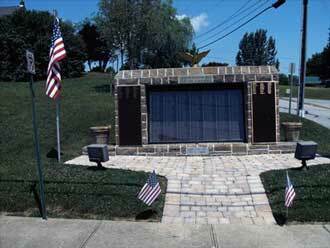 The 7-1/2 acre Clayton Ely Emlg Memorial Park was dedicated on September 30, 1973. A parade was held to mark the event. Clayton Emlg was born in Hallam on November 4, 1862. He was the youngest of ten children. Mr. Emig practiced law in all of the courts in Washington D.C. and was eventually nominated to the Supreme Court. In 1929 he purchased this land with hopes of building a house on it, however, since most of his time was spent in Washington, a house in Hallam was not practical so it was never built. Mr. Emig passed away in 1940. He is buried in Arlington National Cemetery. He was survived by a wife and three daughters. The remaining family donated the land with the stipulation it be designated The Clayton Ely Emig Memorial Park. In 2002, The Cornerstone Development Group donated approximately 13 acres which has enlarged the park to approximately 20-1/2 acres. In 2004, the park was expanded to include an additional pavilion, public restrooms and additional recreational facilities. The Kreutz Creek Valley Lions Club meets the 1st and 3rd Wednesday of the month at Hoss's Steak & Sea House, 3604 E. Market St., York, PA. Their website is http://www.e-clubhouse.org/sites/kreutzcv/. Play pickup basketball at the Beaver St. courts most any evening when the weather is survivable. Walk Forry Ave. and catch up on the latest with the neighbors. 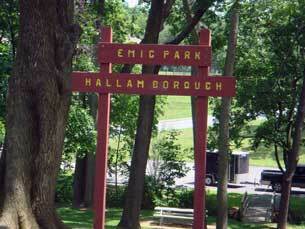 Attend a Hellam Express game and sit in the historic grandstand.